I love baking, I think I have already mentioned that. About a few years ago I discovered the fondant covered cakes. They were back then really not very popular in Germany or in Romania, so I had actually never seen this kind of cakes before. Things are changing now, they are becoming more popular, especially in Romania, where, from what my aunt is telling me, there are a lot of bakers selling fondant cakes already. About 2-3 years ago I started trying to learn about working with fondant. It was pretty hard at first, but slowly I am getting better at it. I have to say that Pinterest has a lot of influence on this learning process. I mean, I bought a few books, but there is no way I could have learned so much just with the books. I am not an expert but I am doing my best, learning something new every time I make a new cake. And I have made a few of them already, for my family and friends, I am always happy when somebody asks for such a cake, the whole process from gathering ideas, making fondant, baking and of course eating is a joy for me. Well, with the exception of the occasional nervous breakdowns occurring when things are not going just the way I planned. One thing I wasn’t crazy about when making fondant cakes was the taste. I am really not a butter cream person and most of the people I know aren’t. In Germany we prefer lighter cakes (I don’t mean light in calories, but fluffier, softer, less compact and definitely less sweet). 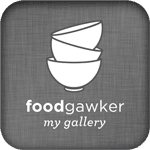 So I was really really happy when I discovered this method of filling cakes with milk products, gelatine and fruit without having to worry about the fondant melting. 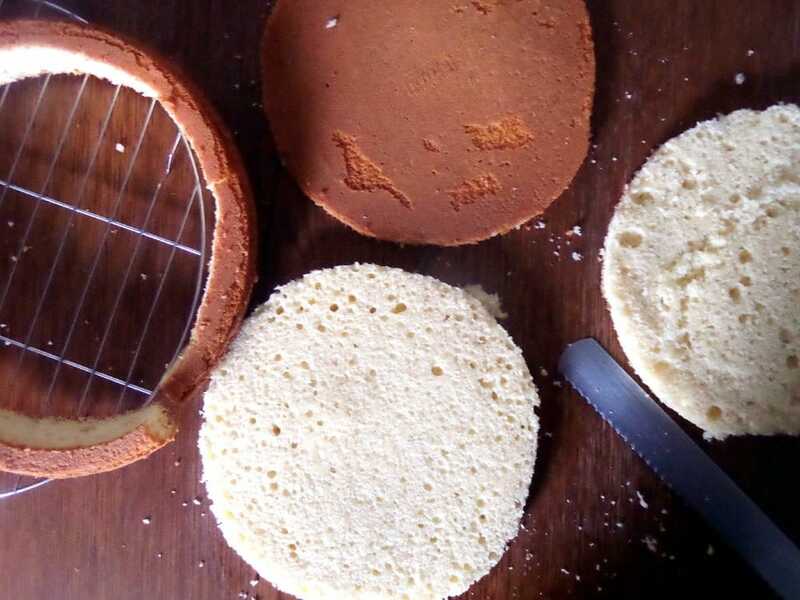 I am especially using this method when making one tier cakes, if the cakes are higher than I usually use butter cream or cream cheese fillings on the lower levels and something else on top. The idea comes from this blog Tortentante, a great cake decorating blog in German. I learned a lot reading it, it is a constant source of inspiration. 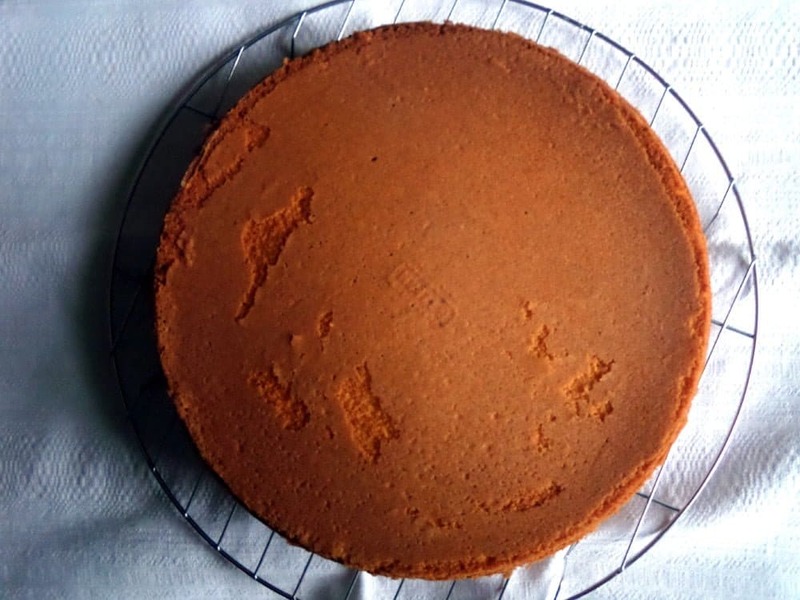 There is no recipe I am sharing now, just a way to cut and fill your cake. Start by baking your cake. I prefer to do it the day before I cut it and then leave it to cool and rest over night. I find it cuts better that way. I prefer to use a 26 cm round spring form, the finished cake will be a bit smaller, about 22-24 cm. Using a sharp knife, cut a stripe of cake all around the cake. It should be about as thick as a finger, a not very thick finger. Keep the stripe, you will need it later. Cut the rest of your cake into 2 or 3 even layers. Keep the best looking slice to place on top of the cake. Take the bottom layer, place it on a cake platter and place a metal ring around it. Take the reserved stripe and fit it inside the ring. You will have to cut a piece of the stripe, because the diameter of the cake is now smaller. Cut carefully and eat the unnecessary piece of stripe if you like. Prepare the filling and pour half of it into the prepared cake. Cover with the middle layer and then pour the rest of the filling over it. 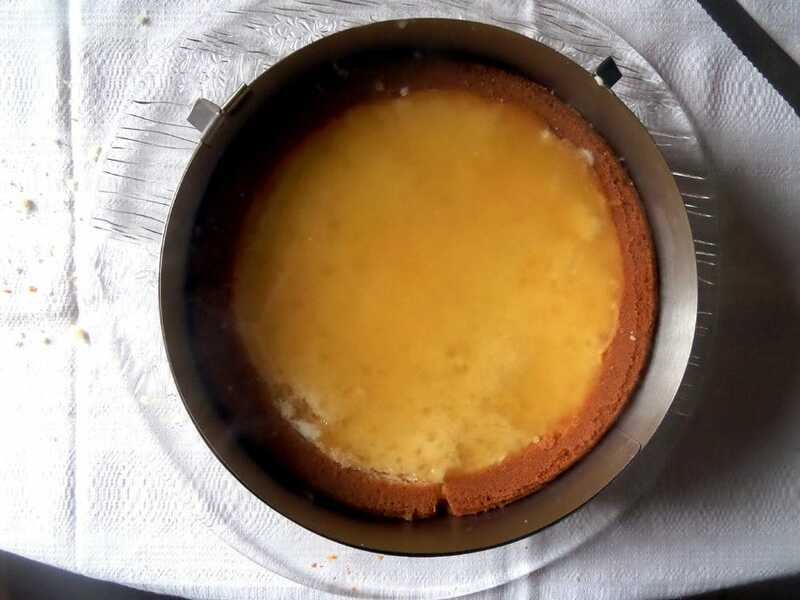 The filling should fill the cake up to the brim. Cover with the top cake slice. The top slice will normally lay directly on the stripe. If the filling is not quite enough, than you can also fit the top layer inside the stripe but then you will have to cut it a bit all around to make it fit. It is easier if you just have enough filling. For this particular cake I used two kinds of filling, one of cream cheese and heavy cream and one of thickened fruit juice on top. You might not necessarily need the middle layer of the cake. I often just pour in all the filling, than cover the cake with the top slice. I forgot to take a picture of the last slice of the cake which I placed on top of the cake. I hope that is not a problem, there is nothing more, just the final slice on top of the fruit juice filling. Press gently the top layer of the cake, make sure the ring is stable, than place the cake in the fridge. Leave it until the filling sets, at least 5-6 hours, ideally overnight. Take the cake out of the fridge and proceed the usual way, that is frost the cake with butter cream or ganache and then cover it in fondant. This is the way a slice of this cake will look like in the end. The stripe will separate the filling from the fondant. 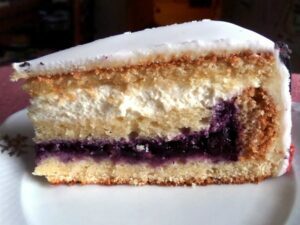 It is a picture of another cake (with blackberries and sour cream filling) but the method is exactly the same. I hope this tutorial is understandable. Just ask, if you have any questions. Take the bottom layer, place it on a cake platter and place a metal ring around it. Take the reserved stripe and fit it inside the ring. 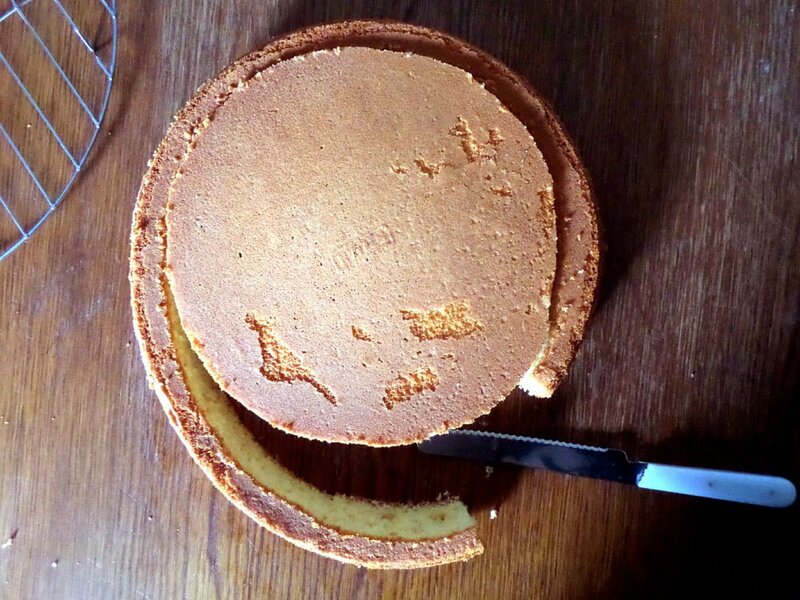 You will have to cut a piece of the stripe now, because the diameter of the cake is now smaller. Cut carefully and eat the unnecessary piece of stripe if you like. Prepare the filling and pour half of it into the prepared cake. Cover with the middle layer and then pour the rest of the filling over it. 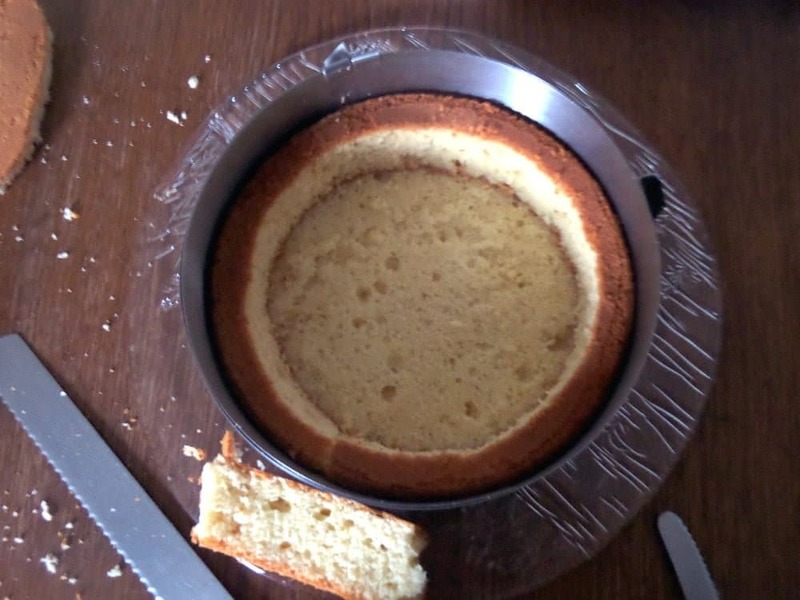 The filling should fill the cake up to the brim. 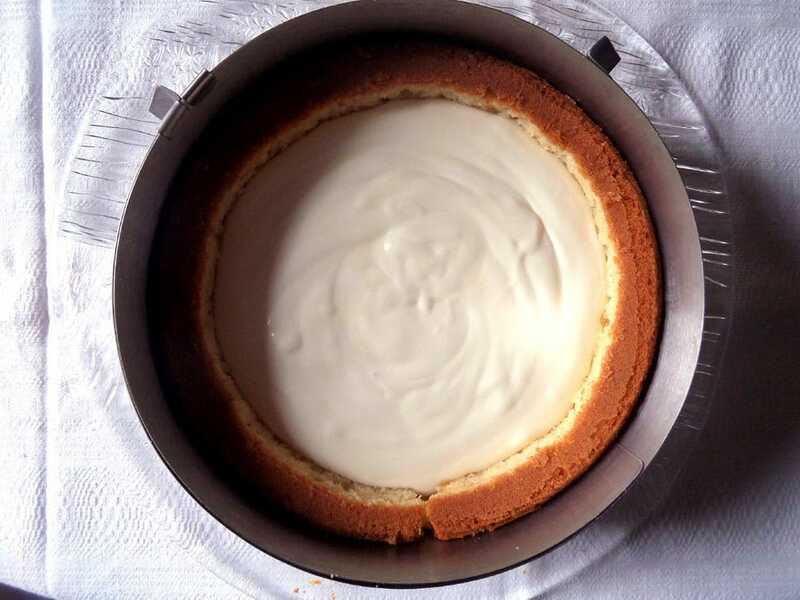 Cover with the top cake slice. The top slice normally will lay directly on the stripe. If the filling is not quite enough, than you can also fit the top layer inside the stripe but then you will have to cut it a bit all around to make it fit. It is easier if you just have enough filling. Take the cake out of the fridge and proceed the usual way, that is frost the cake with butter cream or ganache and then cover in fondant. Super Anleitung–zum ersten Mal ist mir eine tolle Torte gelungen! Vielen Dank! ! dankeschön. ich freue mich, dass es einfach zu folgen war.